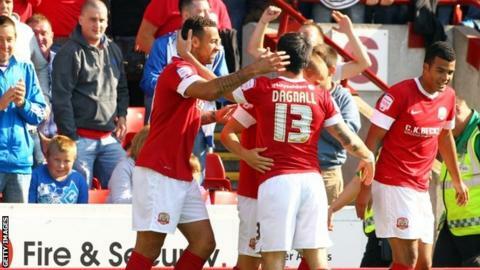 Thomas Ince ruined Barnsley's 125th anniversary celebrations with an equaliser as Blackpool claimed a point. Craig Davies put the home team ahead with a long-range effort but Ince converted Gary Taylor-Fletcher's pass. Both sides pushed for victory, but neither was able to break through as the Seasiders remain second in the Championship table. Tiago Gomes went nearest but his effort was cleared off the line by Barnsley's Scott Golbourne. Blackpool defender Alex Baptiste forced Ben Alnwick to parry a 25-yard strike over the crossbar before Barnsley went ahead. Davies collected a pass from Jacob Mellis and fired in from 20 yards. Blackpool remained on top though and their pressure told as Ince broke free of the Barnsley defence to slot home his fifth of the season from inside the penalty area after a pass from Taylor-Fletcher. Baptiste went close again after the break and Gomes nearly broke the deadlock, but the home side held on for a point.